This checks out. It took 3-5 minutes of shaky starts, but once I put my 2 commons in the Tag match I was rolling in the victory. I've adopted the strategy and it's working pretty well. I win the vast majority of the 5 point games. 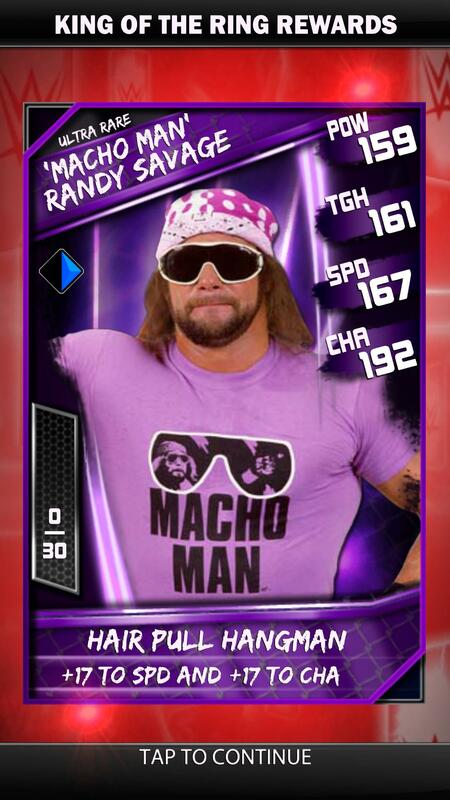 My current line up is Maxed UR Pro Jake Roberts and Macho Man, Maxed UR Miz and the others are jobbers. So far ranked around the 5k mark after I went to bed. It's pretty widely known that most max ✭ cards one level below an untrained card of the same superstar is almost always guaranteed to win a one-on-one match. Even with a UR utility card that boosted an untrained UR Sheamus' P & C stats, it probably still wouldn't be enough to win the one-on-one battle listed above. So, yeah, there's a good reason why I've got him set as champion of my current active deck...no other of my active cards, all SR, have had a second one for me to max out from Exhibition. Might try this one strategy of building up picks from exhibition till it hits 99, win next match and get the 100 is the most picks you can have error, burn a card or 2, lather, rinse, repeat ad nauseam until I finally turn up more SR cards...supposed to be very successful method, but we'll see. I rarely if ever use an untrained card, pro tip. Managed to break the 2k mark to be in to win Epic HBK, then got smacked back to 6k over night. His speed stat is ridiculous when maxed out. Less than a day to go and I'm hovering around the 3.5k mark for an Epic HBK. Somehow completely failed in my last KOTR after dominating the last three tournaments. My line up hasn't changed other than maxing out my Pro UR Mark Henry (does anyone else have two different UR Mark Henry's in their card catalogue? ), so no real idea what happened. Ended up finishing around the 4k mark and getting my first Epic card, which was HBK. Did a couple of games with Epic HBK in my deck and got an Epic Daniel Bryan from selection. Wonder if they will be linked with 2k15, seeing as the little logo is on there. I've peaked as far as tiers go and it's getting boring, so this should help. New tiers are nice. They should add more past wrestlers too, even divas. It does look like a huge jump in stats though, that's pretty much a maxed out Legendary card there. Just got an Epic Big Show through selection, was not expecting that! 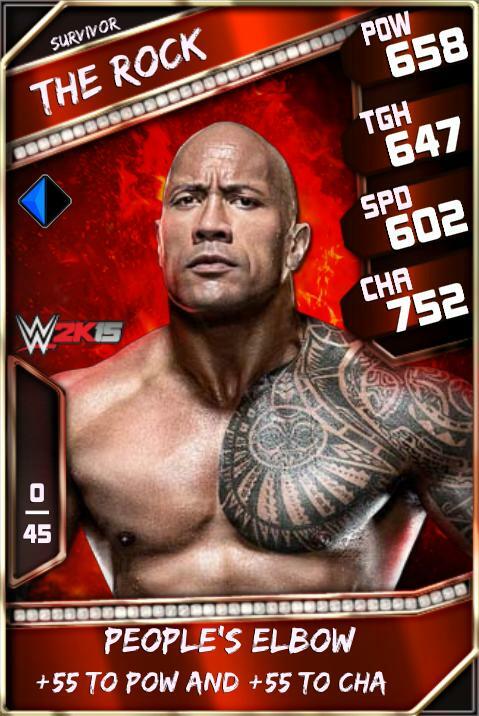 His max pro toughness is in the 900s, ridiculously good card. Does anyone know how to get this to run on Bluestacks. Everytime I try to run it, it tells me it has stopped running. bluestacks is garbage. just keep trying it might work eventually. Is there any other type of simulator I could try. Sadly my phone is a piece a crap and won't play it. Game seems pretty badass thru. Now have Legendary Warrior/Ryback/Jericho/Bryan/Orton/Booker from the last couple weeks of KOTR and about a dozen Epic cards. Feel like I have accomplished my number one goal. I like that they upped the energy cards to 10. And more of Bobby Heenan is never a bad thing. I took affect mid KOTR, instead of a Legendary card I got an Epic, twats. I have yet to see a Survivor card.....finally got a second Big John Studd to complete by Rare collection.